NOTICE OF MEETING TO ADJOURN BOARD OF REVIEW TO LATER DATE NOTICE IS HEREBY GIVEN, the Village of Chenequa, Waukesha County Board of Review will ..
A revaluation of property assessments in 20% of the Village of Chenequa shall occur for the 2019 assessment year. The approximate dates of the revaluation .. Village Trustees approved a resolution to recognize International Migratory Bird Day on Saturday, May 11th. Citizens are urged to celebrate this observance and support efforts .. Village Trustees proclaim April 26, 2019 as Arbor Day in the Village of Chenequa and are urging citizens to support efforts to protect our trees .. Seasonal weight restrictions will be LIFTED on Monday, April 15th. Ten ton weight limits will be enforced until then. Thank you. Board of Review Notice, Revaluation Notice, Adoption of recent resolutions related to receipt of year end audit; Amending the 2018 budget; Renumbering certain sections in Chapters 1 and 4; Recognizing International Migratory Bird Day (May 11th); Updating existing WI employers' group heath insurance program; and Denying claim for excessive assessment; and a proclamation recognizing April 26th as Arbor Day. 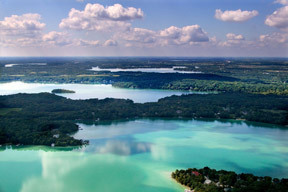 The Village of Chenequa is located in the “lake country” portion of Waukesha County, about 30 miles west of downtown Milwaukee, Wisconsin. It completely surrounds the 703 acre Pine Lake, and includes portions of Beaver Lake and North Lake. The name “Chenequa” comes from the Potawatomi Indian word for “pine”, referring to a rare Southern Wisconsin grove of white pine. 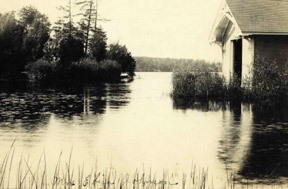 This same stand of white pine can be seen along the Eastern Shore of Pine Lake.